Do you wish to actually live in a free society, rather than just ponder what one would be like? For some, the desire to live in liberty is so strong that they would echo Patrick Henry’s immortal words, “Give me liberty or give me death!” More than just those words should be immortal; in fact, you should be. Without intending it, Patrick Henry communicated a truth that is becoming increasingly apparent in our era: we can one day be truly free if humans achieve indefinite life extension; without it, we will be both unfree and eventually dead. Within our lifetimes, we will either have liberty and no death, or death and no liberty. We cannot have both liberty and death. 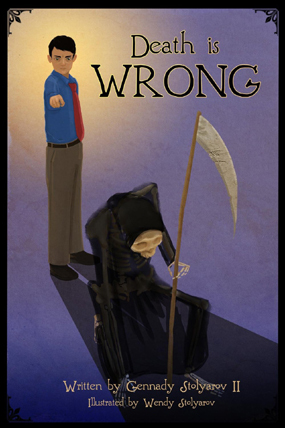 Death is Wrong is my new children’s book on indefinite life extension, beautifully illustrated by my wife Wendy Stolyarov. The book is an educational primer which presents, in a concise, accessible manner the philosophical desirability and scientific feasibility of lifting the upper limit on human lifespans through the application of science and medical technology. We are currently in the midst of an Indiegogo fundraiser to spread this book to 1000 children, free of cost to them. Death is Wrong does not take any political positions and does not advocate specifically for libertarianism, since we seek to focus on life extension in the book and to attract as universal a base of support as possible. It is certainly feasible to hold almost any political persuasion and to advocate the radical extension of human lifespans. Yet I, as a libertarian, see the defeat of senescence through medical progress to be an indispensable component to achieving liberty. The U.S. Declaration of Independence proclaims that humans have the rights to life, liberty, and the pursuit of happiness. While the right to life is a negative right―the right not to have others infringe on one’s life―it is nonetheless indisputable that the positive condition of life is the prerequisite for the exercise of any kind of liberty and the pursuit of any kind of happiness. If one is dead, there is nothing―no choice, no growth, no self-actualization―and not even a memory of any past deed or previous fulfillment of one’s goals. Without life, liberty is impossible, and yet biological decay propels us all toward the loss of the very potential for liberty. Death obliterates everything: our precious individual universes, full of sensations, insights, thoughts, and aspirations are forever snuffed out, deprived of the possibility of ever fulfilling any goal or actualizing any ideal. In “Liberty Through Long Life”―written in April 2013―I described the possibilities for improving the prospects of liberty just on the horizon, facilitated by accelerating technological progress―from emerging methods of online education to cryptocurrencies to seasteading and space colonization. I explained that libertarians should want to live as long as possible in order to see and benefit from the fruits of these tremendous innovations. Just two months after I wrote “Liberty Through Long Life,” most of us in the Western world found out just how unfree we truly were. Especially in the aftermath of Edward Snowden’s revelations that the U.S. National Security Agency and its counterparts in many Western countries are spying indiscriminately on hundreds of millions of innocents, it has become apparent that the political struggle for liberty in today’s climate has encountered barriers that appear, at present, virtually insurmountable. I am not referring to failure to achieve the libertarian political ideal or even a directional approach toward such an ideal―despite the ardent, passionate, unquestionably dedicated work that activists for liberty have done during and between the past several election cycles. The situation today is worse than that. Even abolishing the Orwellian spying apparatus and penalizing those officials who concealed and then endorsed it appears to be seen as out of the question by the political elite, no matter how great the pressure from the public and how completely useless the mass spying has turned out to be. More than ten months after Snowden’s revelations, all of the powerful people who orchestrated the mass surveillance remain in their offices, and Snowden is a fugitive in Russia. Now it has even been disclosed that the NSA has devised programs to harvest data from private hard drives, webcams, and microphones by infecting personal computers with malware in mass. Can we expect to see an end to what we would have, just one year ago, considered an unimaginably intimate surveillance―or, more likely, will the gatekeepers of the current political order assemble all of their power in the effort to perpetuate it? Achieving mere non-perversity―not to mention liberty―as an immutable principle for contemporary Western political arrangements to follow, would appear to be a Herculean task. Slavery was ultimately abolished through a long sequence of often highly sub-optimal steps―but, were it not for the uncompromising immediate abolitionism of people like Garrison, it might not have been abolished at all, or at least would have been abolished much later. If we argue for liberty today, it will still likely take decades of the most ardent advocacy and activism to undo the harms caused by ongoing and escalating infringements of every natural and constitutional right of even the most law-abiding citizens. Therefore, while I support every effort―conventional or radically innovative―to move our societies and governments in the direction of liberty, it is essential to recognize that the success of such efforts will take an immense amount of time. If you do not remain alive during that time, then you will die without having known true liberty. Yet we should urge not just the immediate abolition of oppression―but also of death itself. The forward-thinking outliers today―thinkers in the transhumanist and life-extension movements―recognize that transitioning from today’s medical system to one in which humans could achieve longevity escape velocity―where every year lived increases life expectancy by more than one year―will likely take decades of the most dedicated efforts in research and advocacy. Dr. Aubrey de Grey of the SENS Research Foundation, one of the foremost advocates of indefinite life extension, thinks that there exists a 50% chance of reaching longevity escape velocity in 25 years, with adequate funding. Yet, in order to catalyze the culture to embrace, or at least not oppose, the research projects and medical therapies needed, the sentiment that the abolition of death for innocent humans is desirable yesterday is imperative. This is a sentiment with which libertarians can find a close kinship, for they know well the desire for liberty to be here yesterday. This does not mean that we should forsake long-term plans or disdain incremental improvement in lifespans or medical treatments. Quite the contrary, the achievement of the great goal of preserving each innocent life will be made out of a long sequence of such incremental improvements that will save an increasing proportion of people with each new feat of progress. But we should also strive to greatly accelerate progress in biogerontological research and medicine, so that the breakthroughs can come in time to save us and those whom we cherish. Educating the next generation to work with full dedication toward both liberty and immensely longer lifespans is a key component of this new abolitionism of the 21st century. Every bit of liberty achieved for medical innovators and cutting-edge researchers in biotechnology and nanotechnology will be a boon to the rate of progress. Every bit of lifespan extension will give activists for liberty more time to reverse Western political systems’ gallop toward totalitarianism, or to develop innovative workarounds that bypass the political systems altogether. Death is Wrong breaks with the prevalent traditional approaches of teaching children about death―approaches which either attempt to justify death through arguments that devalue the moral worth of human life entirely, or else endeavor to persuade children to resign themselves to an inevitable if regrettable end and to fill their time with other pursuits to get the thought of death out of their minds. Instead, the book confronts the predicament of human mortality head on and shows young readers that death is neither insurmountable nor just; instead, it can be defeated, albeit with great effort. My hope is that enough young minds will be motivated by Death is Wrong to acquire the skill sets in science, philosophy, and advocacy needed to accelerate the arrival of indefinite longevity. More generally, I hope that the book will challenge children to break from conventional packages of thinking and engage every single idea critically and actively, eventually arriving at practical and moral worldviews based on principles that correspond to reality rather than the surrounding majority opinion. Every day approximately 150,000 humans die throughout the world―100,000 of them from diseases of senescence. Every day by which we can hasten the arrival of indefinite longevity, at least 100,000 precious individual universes will be preserved and will be able to join us in contributing their ideas and actions toward a free, just, humane society that respects and protects the rights of every individual. The contribution of indefinite life extension to human survival rates will likely even be beyond the gains reached solely due to medical progress. As I explained in “Life Extension and Risk Aversion,” the longer people’s lifespans and time horizons become, the more conscientiously they will seek to avoid or diminish physical hazards that could deprive them of hundreds or thousands of years of expected life. Exceptionally long-lived humans will work with far more intensity to reduce the prevalence of accidents, infections, natural disasters, crimes, wars, and―yes―politically motivated physical harm. A society comprised of such young supercentenarians would quickly become one of libertarians. Libertarians can help by joining the movement for indefinite life extension and supporting the fundraiser to spread Death is Wrong to 1000 children―the next generation whose work may well enable us all to live in true liberty one day. May we have liberty―and defeat death! 1. Quoted in William H. Pease & Jane H. Pease, eds., The Antislavery Argument (Indianapolis: Bobbs-Merrill Co., 1965), p. xxxv.